Legendary Comedian Allu Ramalingaiah has entertained the Telugu audience for almost 5 decades ever since he made entry into the industry . He had left a benchmark for the upcoming generations. He will be remembered for some memorable roles in all time classics like Mayabazar’ , ‘Missamma’ , ‘Sankarabharanam’ . 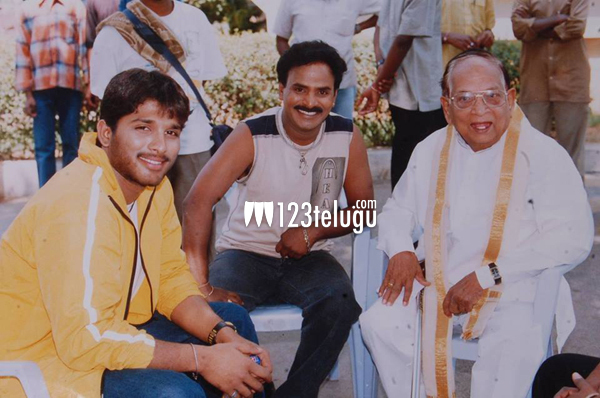 We are bringing a rare photo of Allu Ramalingaiah and his grand son Allu Arjun sharing a funny moment during the shooting of ‘Arya’. At that time he used to visit the sets of ‘Arya’ shooting and this photo was taken on one such occasion in which comedian Venu Madhav is also seen.